Visit: Centacare general manager Tony Davies (left) with Fr Frank Brennan and Family and Disability Services manager Tania Slack-Smith. CENTACARE staff in Port Macquarie met with the head of Catholic Social Services Australia recently to discuss the impact of the National Disability Insurance Scheme. 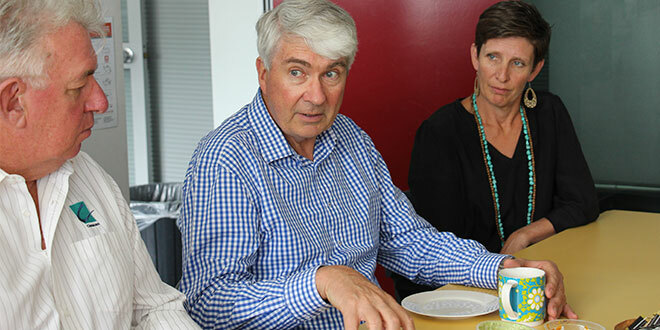 CSSA chief executive officer Jesuit Father Frank Brennan visited Port Macquarie for the discussions and toured facilities in Port Macquarie and Kempsey. Centacare general manager Tony Davies said part of the reason for Fr Brennan’s visit was that St Agnes’ Parish was unique in Australia in the way it had developed services that supported people in the community throughout their lives. “Through Fr Brennan’s visit my staff have been able to share with him their concerns about the impact of NDIS on people with disabilities in rural areas, especially around travel costs, funding and the provision of specialist services,” Mr Davies said. Fr Brennan, a long-time advocate for human rights and social justice in Australia, said he was impressed by the way St Agnes’ Parish served its community and the pride shown by employees in being “part of the parish”. “Pope Francis is encouraging members of the Church to get out among the people to serve the needs of the poor and disadvantaged, and that’s what I am seeing through your service,” he said. “A silo mentality exists at a broader national level that separates health, education and social services – here, you have the structures and culture in place that break down those silos so service is delivered to your community in a unified way. “Not-for-profit organisations, like yours, have a tradition of serving the ‘poorest of the poor’, those with the greatest need, and the supply of services to these clients often comes at a high cost, which the new funding model does not take into account. He said parish priest Fr Leo Donnelly “has been a strong advocate for reaching out to help those in need in our community”.